If you’ve ever moved homes before, you know how stressful it can be. Moving is considered one of the top 5 stressors. It’s right up there with divorce and experiencing a death in the family! Though any life event that disrupts your routine is mentally taxing, there are ways to ease that pressure. One way to make a move easier on the family is by staying on top of things. It’s hard to get organized during this chaotic period. With a moving checklist, you’ll be able to keep track of what needs to be done. Are you getting ready to relocate to another city or state? If so, you need to establish a moving timeline. Follow this checklist to stay organized. Although the move seems like it’s ages away, now’s the time to start prepping. It’s crucial you lay the right groundwork now. Then you won’t have to rush to pack later on in your moving timeline. Go through your entire house one room at a time. Sort through closets and drawers. Throw out or donate anything you don’t need or haven’t used in a long time. Research moving companies in your area. Ask friends and family is they have any recommendations, too. Then call up these businesses and get a quote. Be sure to keep track of prices and who you talked to. This is your place to keep any papers that are moving related. Keep your moving quotes and inventory list here. You’ll also want to keep your receipts in case they are tax deductible. Order and collect any moving supplies you’re going to need. Keep them in one designated area. Having boxes, tape, and bubble wrap all over the house will be sure to stress you out! If you didn’t already, get measurements of doorways and room dimensions of your new home. Then measure all of your larger furniture in the house. Decide what will fit and what won’t. Did you find out your couch won’t fit through the front door? You have time to sell it and look into ordering a replacement to be delivered after you move in. Now it’s really time to get hustling. A month goes by faster than you think, so it’s time to start packing. Get a confirmation of the date, time, and price in writing. Be sure to put that in your moving binder! Begin with items you know you won’t need over the next month. Make notes of high price items that you might want to get additional moving insurance for. Be sure to label each box with the contents and what room it’s meant for. You can even number each box and keep a list of everything inside. Keep all important items in their own boxes labeled “essential”. That way you know which boxes you should unpack first. If you’re moving far, now’s the time to move medical and school records to the new district. File a change of address with the post office. Remove items from the safety deposit box so you can bring them to your new bank. Hopefully, you already got your Neighborhood Score before you bought your new house. If you did, there’s still some more research you can do. Find out the location of the nearest hospital, grocery store, and gas station. Make a note of where you should order food from on your first night in your new home. Little things like this can make your first week easier while you unpack. If you’ve been following your moving timeline these last two weeks shouldn’t be too stressful. Just keep packing and remember you’re nearing the finish line. Double check that the date, time, and payment are confirmed. Make sure that they have the correct addresses of the new and old homes. Even the most well-behaved kids and pets can get upset by a move. Eliminate the stress of keeping track of them. Secure a sitter and/or a kennel for your animals. Leave aside the last few items you’ll need for the remaining time. Pack up everything else. In these last few days, you should be just tying up loose ends. Everything should be in boxes except for your daily necessities. In here should be your toiletries, paper plates, sheets, pajamas, and anything else you might need your first night. That way there’s no tearing apart boxes and making a mess trying to find things. Check in with everyone who might be involved with moving day. Make sure everyone is on the same page. An often overlooked task. If you’re taking the fridge, make sure to empty and defrost it 24 hours in advance. You’ve finally reached the end of your moving timeline! Now you can leave the heavy lifting up to the pros. Pat yourself on the back and order yourself a pizza for dinner. After the movers have finished, sign the bill of lading. Keep a copy for yourself, and of course, put it in your binder. Take a walk through the house. Make sure all belongings are out and that there are no messes to clean up. While you’re taking care of moving, you still have to tend to your everyday responsibilities. The key to making it all manageable is to start early. Doing smaller chunks over time is always easier than doing everything at once. 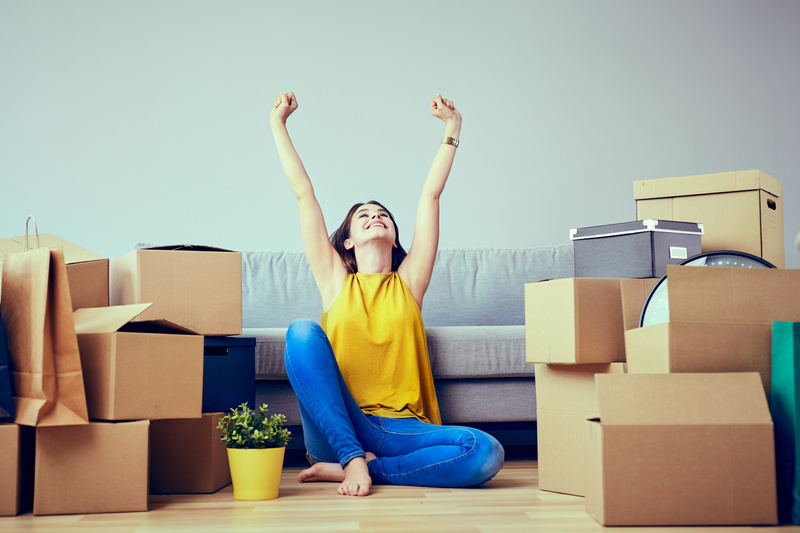 After you move into your new home it’s time to start making it your own. Check out these DIY articles for some inspiration.